On Thursday, 1st June 2017, the world was rocked by US president Donald Trump’s announcement of his intention to withdraw the from the Paris Agreement. In the wake of this, individuals – from scientists to politicians – have assured that the United States’ pulling out from the Agreement would not mean an all-consuming end to the fight against climate change. However, Trump’s decision was, and is, still viewed as a momentous setback to the progress which has been made in the global climate arena. Sadly, Trump’s withdrawal has overshadowed many of 2017’s ‘good news’ environmental stories. In light of this, we have decided to dedicate this blog post to highlighting some of the positive local and global events in the carbon and climate change arena which took place last year. Enjoy. South Africa’s Robben Island is well recognised as being a political and historical monument, and World Heritage Site. Few people realise that it is in fact a working Island, with over 100 residents, a light house and a harbour. The Island receives more than 300 000 annual visitors, and uses almost two-million kilowatt-hours of electricity every year. In October 2017 Robben Island’s solar energy micro-grid went live. The R25-million project is expected to produce almost 1 million kWh of clean electricity annually – representing almost half of the Island’s yearly electricity requirements. Prior to the grid, Robben Island was dependant on diesel for its energy requirements. 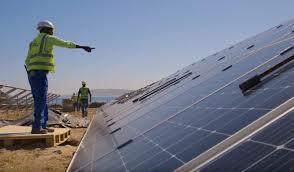 It is estimated that the new solar grid will reduce the use of diesel generators on the Island by approximately 45%. Tourism Minister Tokozile Xasa said that the Island’s annual diesel usage will drop from around 619 000 litres to 344 000 litres, which equates to a saving of 735 tonnes of CO2e. 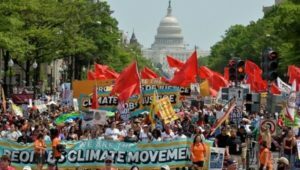 Let’s not forget the 29 April 2017 where an impressive collection of hundreds of thousands clean energy activists who marched in the People’s Climate March in Washington, DC in defiance of Trump’s plans to reverse climate change policies. The UK went a full day without coal-generated power for the first time since the Industrial Revolution. In June 2017 the country reported 50.7% of its energy demand was being generated by renewables for the first time. According to World Wildlife Fund (WWF) last summer was the cleanest one on record with more than half of all electricity coming from low-carbon sources between June and September. Britain has halved carbon emissions in the electricity sector since 2012 to provide the fourth cleanest power system in Europe and seventh worldwide. British wind farms generated more electricity than coal plants on more than 75% of days in 2017. While solar outperformed coal for more than half of the year. On one day in June wind, nuclear and solar all generated more than gas and coal combined for the first time. Hydropower also set records for output and coal reached a record low price in September. Globally, renewable energy has gained momentum, with a significant rise in the uptake of various renewable energy technologies such as solar photovoltaics (PV), wind energy, biogas and other biofuels, hydroelectricity and concentrated solar power (CSP). In the United States, despite Trump’s radical approach to climate change, individual clean energy sectors saw growth, and reached impressive new milestones. The solar energy industry had its most successful second quarter ever, with 2 387 megawatts of new solar photovoltaics installed – representing an 8% increase year-on-year. Hydropower generation in the country increased 7% year-on-year and now accounts for 6.5% of the nation’s electricity. In February 2017, the United States Department of Energy reported that American clean energy employment officially surpassed three million workers across industries including solar, wind, and hydropower. Clean energy jobs now outnumber fossil fuel jobs in 41 states, and renewable energy is creating employment at 12 times the rate of the rest of the economy. Procured over 6 300 Mega Watt peak (MWp) of renewable energy generation capacity, of which over 2 500 MWp has been connected and is feeding electricity into the national grid. Selected 102 preferred bidders to develop utility-scale projects across the country – with projects in every province across South Africa. Received a ministerial determination to procure a further 6 300 MWp of generation capacity. This is the second-time capacity to the programme has been doubled – a testimony to its success. Attracted over R195 billion of investment into South Africa, with over 25% from foreign investors. In doing so, the programme, through local content requirements, has successfully stimulated the development of a local RE technology components manufacturing sector. Achieved significant technology price reductions, with South Africa boasting some of the world’s lowest clean energy costs. In November 2017 Bloomberg reported that global electric car sales had surged in the third quarter of 2017. Sales of battery electric vehicles and plug-in hybrids exceeded 287 000 units in the three months ended in September, 63% higher than the same quarter a year ago and up 23% from the second quarter. This jump has primarily been attributed to heightened demand in China, a country which accounted for more than half of global electric car sales as a result of its government’s efforts to reduce pollution. 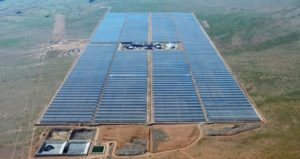 KaXu Solar One concentrated solar power (CSP) project, was on the 15 November 2017, presented with a Momentum of Change award by the UN Framework Convention on Climate Change. KaXu is a 100MW plant constructed on a 1 100ha site near the town of Pofadder in the Northern Cape. The solar power project was officially opened in March 2015. It supplies clean energy to approximately 80 000 African homes while offsetting 315 000t of CO2 emissions a year. The project contributes to South Africa´s goals of achieving up to 17 800 MW of renewable energy by 2030, and reducing its dependence on oil, natural gas and coal. Overall 2017 saw some impressive green milestones – we haven’t even scratched the surface in this post. It is important to keep these in mind when we feel despair with news of rising emissions, higher temperatures, devastating hurricanes, droughts, wildfires and of course, Trump’s attitude to climate change. Keep an eye out for our next post in which we will discuss the reasons to be hopeful about what 2018 has to hold for the environment.